Dr. Rahul Gupta currently serves as the senior vice president and chief medical and health officer of March of Dimes. Prior to this, Dr. Gupta served as the commissioner and state health officer for West Virginia from 2015-2018. 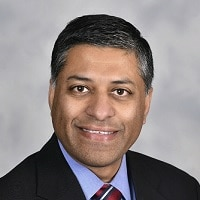 Dr. Gupta is a practicing internist with 25 years of clinical experience who also has faculty appointments as an Adjunct Professor in the Department of Health Policy, Management and Leadership at the West Virginia University School of Public Health, Associate Professor at the University of Charleston School of Pharmacy, and visiting faculty at the Harvard University T.H. Chan School of Public Health. Dr. Gupta earned a Doctor of Medicine degree and received subspecialty training in pulmonary medicine from the prestigious University of Delhi and completed his internship and residency training at St. Joseph Hospital at Northwestern University in Chicago, Illinois. Additionally, he earned a Master of Public Health (MPH) degree in healthcare organization and policy from the University of Alabama at Birmingham and a Master of Business Administration (MBA) degree in innovation and technology management at the London School of Business and Finance. He is also a Fellow of the American College of Physicians. Dr. Gupta has authored more than 125 peer-reviewed scientific publications in medicine and public health and served as a principal investigator for numerous well-known clinical trials. He presently serves as the Secretary of the West Virginia Board of Medicine. He was elected to lead his peers as the 2016-2017 President of the West Virginia State Medical Association. Dr. Gupta is a steering committee member at the National Quality Forum on Population Health and the Institute for Health Metrics Evaluation. He currently serves as the Region III Director of the Association of State and Territorial Health Officials (ASTHO) Board of Directors. He also serves as Chair of ASTHO’s Prevention Policy Committee and the Tobacco Issues Forum. He is a former member of the National Association of County and City Health Officials (NACCHO) Board of Directors. As the recipient of several state and national awards, including the 2016 Howell Special Meritorious Service Award to Public Health by the Southern Health Association; the 2015 Milton and Ruth Roemer Prize for Creative local public health work by the American Public Health Association; the 2015 Jay Rockefeller Lifetime Achievement Award on the advancements in public policy in healthcare; and the 2013 Marie Fallon Award for Public Health Leadership by the National Association of Local Boards of Health, Dr. Gupta is a national and global leader in transforming public health practice to advance health equity and create healthier communities. In 2017, the West Virginia Human Rights Commission recognized Dr. Gupta as a Civil Rights Day Award honoree for his outstanding contributions in the areas of civil rights, human rights and the betterment of West Virginia’s citizens. Also, in 2017 Dr. Gupta was named West Virginian of the Year for his work towards battling the opioid epidemic by the Pulitzer prize-winning Charleston Gazette-Mail.